Automatic Duplex Printing (2-Sided). USB 2.0 and Parallel Connections. Add to Favourites. We will always go out of our way to source the product you are looking for. Automatic Duplex Printing (2-Sided). Print up to 28 Pages Per Minute. We will always go out of our way to source the product you are looking for. Add to Favourites. USB 2.0, Ethernet and Parallel Connections. OKI MICROLINE 280 DOT MATRIX PRINTER REFURBISHED. OKI Microline. Superb small dot matrix printer. Printer has been fully dismantled and thoroughly cleaned. As with all our refurbished printers the following work has been completed. 1 x OKI B720N. 45PPM A4 LED Network Ready Mono Desktop Laser Printer. USB, Network, Parallel & Serial. USB, Parallel, Serial & Ethernet Connection. Up to 45ppm Mono Print. Printer Specification. 1200 x 1200 dpi Print. WAS IN USE UNTIL 3 WEEKS AGO, GOOD WORKING CONDITION. 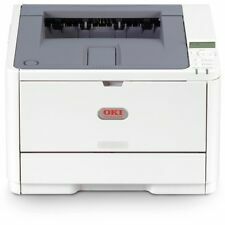 5000 series type oki a4 laser printers for sale, either as a job lot or may split. Also have a large amount of consumables & duplex units that can be negotiated for a price. Parallel connection. 9-Pin Print head. Print up to 300cpm. Print up to 4 multi-part forms (Original 3 copies). We will always go out of our way to source the product you are looking for. Add to Favourites. Supplied as new with 6 months RTB warranty. Refurbished Oki B440DN laser printer. 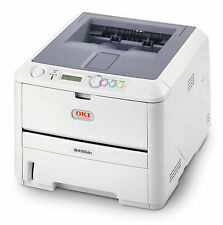 Here we have a nice Oki B440DN printer With 6 months warranty (see below). Plus a powerful engine enables ultra-fast, high-quality colour printing.  Manufacturer Reference: 44318608. Ink & Toner.  Colour: Black. Official Ryman Outlet. From Official Ryman Outlet.  Page life approx 11,000 pages. Paper & Printing. Help & Advice. Oki Microline 280 Elite Dot Matrix Printer. The Printer Broker Ltd is a supplier of printers, fusers and printer parts based in Bolton, Greater Manchester, UK. Missing Rear Flap. OKI ES4131dn A4 Mono Laser Printer. Part : N22203BX. The Printer Broker Ltd is a supplier of printers, fusers and printer parts based in Bolton, Greater Manchester, UK. For sale is our old OKI Fax / Mono printer. we have upgraded to a large format printer / fax so have no use for this any longer. 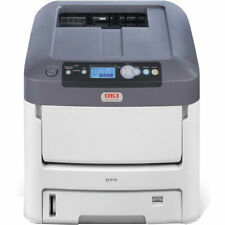 OKI B432DN MONO LED LASER PRINTER. Ideal for fast personal printing or for sharing on the network, the quick device is Google Cloud Print Ready, as well as being compatible with AirPrint by Apple Inc, enabling remote printing from smartphones and tablets when away from the office, without having to connect directly. OKI MICROLINE 3320 ECO. 1 x OKI ML3320 Eco Dot Matrix Printer. Dot Matrix Printer. Cotswold Printers. Islands and. Northern Ireland . UK mainland and excludes. If you need help with your installation our engineers will be happy to help you. Cash on collection. Its a heavy piece of kit. Using Windows 7 I got the driver software with no fuss. Zero fuss. Zero Fiddling. 1 Black & 2 Cyan. Automatic Duplex Printing (2-sided). USB,Parallel and Ethernet connections. Print up to 28ppm. Print, Copy, Scan & Fax functions. We will always go out of our way to source the product you are looking for. MPN : MB290. Manufacturer Oki Data. Fax Type Plain paper. Print count : 41,679. CG 212262 Print count - 41,679 Toner Remaining 47%. Microsoft Certifications Certified for Windows Vista. Maximum Copies 99. A3 forever laser dark. A3 laser transparent. not sure about warranty transfer. free transfer papers included forever glossy finishing paper. OKI Microline 321. 1 x OKI Microline 321. A3 A4 9 Pin Dot Matrix Printer. Parallel and Serial Connections. 1 x Ink Ribbon. 1 x Power Cable. Warranty ; 6 Months RTB Warranty. Refurbished Oki B410D laser printer. 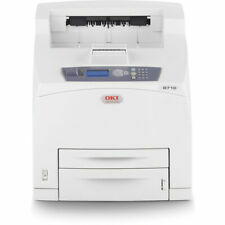 Here we have a nice Oki B410D printer With 6 months warranty (see below). Parallel connection. Print up to 240 char/sec - max speed. Add to Favourites. We will always go out of our way to source the product you are looking for. Refurbished Okifax 5650 Laser fax machine. Here we have a nice Okifax 5650 laser fax With 6 months warranty (see below).